There has been something of a theme of late as far as Liverpool FC are concerned. The 3-0 and 5-0 wins over Bournemouth and Watford appear to be anomalies almost in a series of performances in which we have dominated proceedings but been unable to find the winning goal. Stalemates with West Ham, Leicester, Manchester United and now Everton – all games that we’ve been the better side – means that, for all our good intentions, we’ve dropped eight points since the very end of January in matches we really ought to be winning. Can you see Manchester City being so forgiving on their opponents? Of course not, and unless Jurgen Klopp finds a way to force home our advantage, particularly on the road, then we will continue to lose ground in the title race. Of course, it would be ridiculous to start getting hysterical now that we’re a single point behind City, and even more ridiculous to press the panic button. Mind you, fine margins have a habit of deciding these things, and so the 0-0 draw with Everton can be filed under ‘frustrating’ for a number of reasons. We never really looked like conceding for starters, while Mo Salah had a gilt-edged chance saved when one on one with Jordan Pickford. The Egyptian was also halted by a goal-saving tackle from Michael Keane as we banged on the door but couldn’t step over the threshold. “Situations like today you have to finish it off. To be successful in football you have to be stable, and we were the better side today,” Klopp said in his post-match interview. “Not perfect but good enough, getting a point from Everton is always a success because it is our most difficult away game of the season. The manager would also go on to blame the wind for our troubles, but sorry Jurgen: we’re not having that as an excuse! The good news is that we return to Anfield on Sunday, where we remain unbeaten this term, to take on Burnley in a game which, no offence intended, we are expected to win all three points. The experiment to allow Divock Origi to keep his place on the left-hand side after his fine showing against Watford, with Bobby Firmino on the bench, didn’t really work against the Toffees, and so we expect the Brazilian to be restored to the starting eleven ahead of the Belgian. The onus will be on the Reds to get on the front foot here, with Burnley only too happy to sit deep and wait for their chance to break. So do we really need a double defensive pivot in midfield? We’d argue not, and that a bit more thrust from the middle of the park would help to take some of the goalscoring pressure off of the front three. For that reason, we hope that Klopp restores Naby Keita to the starting eleven here in a midfield trio alongside Fabinho and Gini Wijnaldum. 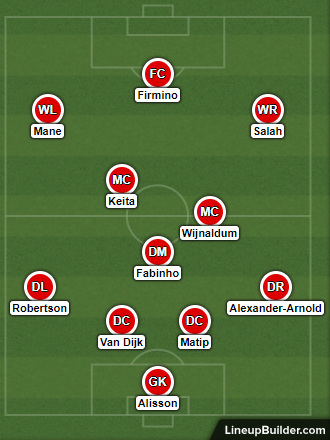 The back four, as ever, picks itself, with injuries keeping Joel Matip in alongside Virgil van Dijk at centre back while Trent Alexander-Arnold and Andy Robertson take up their positions on the flanks. Burnley were slowly but surely clawing their way up from the dreaded relegation zone, but a couple of defeats lately have halted their progress. Between December 30 and February 25 the Clarets were unbeaten, winning five and drawing three of the eight games they played; including four points taken from Manchester United and Tottenham. But a pair of fairly crushing defeats – 0-2 at Newcastle, 1-3 against Crystal Palace – has rather dampened expectations. It will come as no surprise to learn that Liverpool really ought to be winning this game. Yes, we’re the better side, but there’s also something about how Sean Dyche goes about his business on the road against big six teams that suggests we should thrive: their formline away from home against the elite reads W0 D1 L3, with eleven goals conceded. We have no major injury concerns, have enjoyed a week off and so really there cannot be any excuses. The bookmakers require little persuasion, making the Reds a 2/11 shot here; that makes finding value tricky. Our old favourite, Liverpool to Win to Nil, is available at a tempting price of 10/11, although be warned that Burnley have scored in 10 of their last 12 outings. If you’re looking for a more speculative play, Mo Salah to score two or more goals at 16/5 looks interesting. He may have gone off the boil – by his own incredible standards – but is still getting into good positions, and could easily have bagged a brace against Everton last time out.